Think high tea, romantic music, beautiful vases filled with roses, white gloves, pearls, cucumber sandwiches and exotic chocolate desserts while sipping some Queen Bee Tea dribbled with some of our Queen Bee Rose Nectar elixir. Goddess Heaven in a cup! 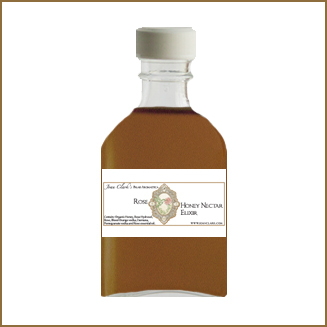 Contains: Organic Honey, Rose Hydrosol, Rose, Blood Orange vodka, Damiana, Pomegranate vodka and Rose essential oil.